Your current on-premises Exchange organization is Microsoft Exchange Server 2003 or later. Your on-premises Exchange organization has fewer than 2,000 mailboxes. Even though cutover migration supports moving up to 2000 mailboxes, due to length of time it takes to create and migrate 2000 users, it is more reasonable to migrate 150 users or less. You can move your entire email organization to Office 365 over a few days and manage user accounts in Office 365. A maximum of 2,000 mailboxes can be migrated to Office 365 by using a cutover Exchange migration. However, it is recommended that you only migrate 150 mailboxes. The primary domain name used for your on-premises Exchange organization must be an accepted as a domain owned by you in your Office 365 organization. After the migration is complete, each user who has an on-premises Exchange mailbox also will be a new user in Office 365. But you'll still have to assign licenses to users whose mailboxes are migrated. After your on-premises and Office 365 organizations are set up for a cutover migration, post-setup tasks could impact your users. Administrators or users must configure desktop computers: Make sure that desktop computers are updated and set up for use with Office 365. These actions allow users to use local user credentials to sign in to Office 365 from desktop applications. Users with permission to install applications can update and set up their own desktops. Or updates can be installed for them. After updates are made, users can send email from Outlook 2013, Outlook 2010, or Outlook 2007. Potential delay in email routing: Email sent to on-premises users whose mailboxes were migrated to Office 365 are routed to their on-premises Exchange mailboxes until the MX record is changed. How does cutover migration work? The main steps you perform for a cutover migration are shown in the following illustration. The administrator communicates upcoming changes to users and verifies domain ownership with the domain registrar. The administrator prepares the servers for a cutover migration and creates empty mail-enabled security groups in Office 365. 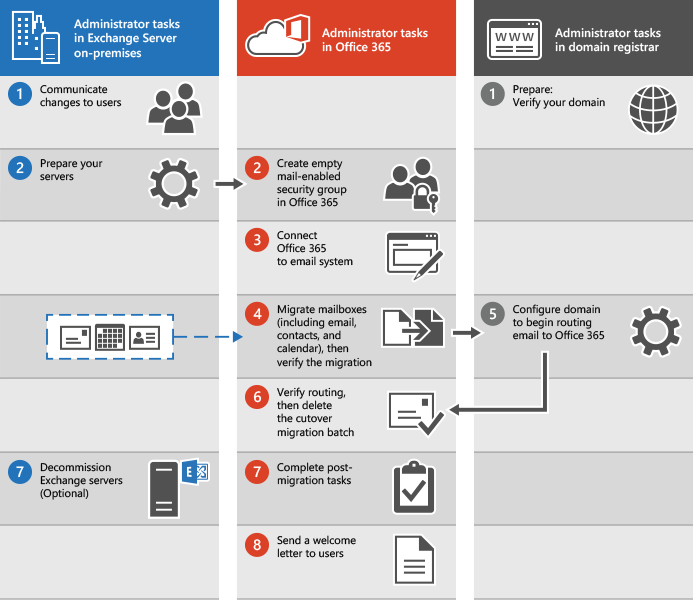 The administrator connects Office 365 to the on-premises email system (this is called creating a migration endpoint). The administrator migrates the mailboxes and then verifies the migration. Grant Office 365 licences to your users. The administrator configures the domain to begin routing email directly to Office 365. The administrator verifies that routing has changed, and then deletes the cutover migration batch. The administrator completes post-migration tasks in Office 365 (assigns licenses to users and creates an Autodiscover Domain Name System (DNS) record), and optionally decommissions the on-premises Exchange servers. The administrator sends a welcome letter to users to tell them about Office 365 and to describe how to sign in to their new mailboxes. Ready to run a cutover migration? Expand the sections below and follow the steps. Before you migrate mailboxes to Office 365 by using a cutover migration, there are a few changes to your Exchange Server environment you must complete first. If you have turned on directory synchronization, you need to turn it off before you can perform a cutover migration. You can do this by using PowerShell. For instructions, see Turn off directory synchronization for Office 365. Optional: Verify that you can connect to your Exchange organization using Outlook Anywhere: Try one of the following methods to test your connection settings. Disable Unified Messaging (UM): If UM is turned on for the on-premises mailboxes you're migrating, turn off UM before migration. Turn on UM or the mailboxes after migration is complete. Create security groups and clean up delegates: Because the email migration service can't detect whether on-premises Active Directory groups are security groups, it can't provision any migrated groups as security groups in Office 365. If you want to have security groups in Office 365, you must first provision an empty mail-enabled security group in Office 365 before starting the cutover migration. Additionally, this migration method only moves mailboxes, mail users, mail contacts, and mail-enabled groups. If any other Active Directory object, such as user mailbox that is not migrated to Office 365 is assigned as a manager or delegate to an object being migrated, you must remove them from the object before migration. During the migration, the Simple Mail Transfer Protocol (SMTP) address of each on-premises mailbox is used to create the email address for a new Office 365 mailbox. To run a cutover migration, the on-premises domain must be a verified domain in your Office 365 organization. On the Domains- page, click Add domain to start the domain wizard. On the Add a domain page, type in the domain name (for example, Contoso.com) you use for your on-premises Exchange organization, and then choose Next. On the Verify domain page, select either Sign in to GoDaddy (if your DNS records are managed by GoDaddy) or Add a TXT record instead for any other registrars > Next. Follow the instructions provided for your DNS hosting provider. The TXT record usually is chosen to verify ownership. You can also find the instructions in Create DNS records for Office 365 when you manage your DNS records. In the Office 365 domain wizard, choose done, verify now, and you'll see a verification page. Choose Finish. If the verification fails at first, wait awhile, and try again. Do not continue to the next step in the domain wizard. You now have verified that you own the on-premises Exchange organization domain and are ready to continue with an email migration. 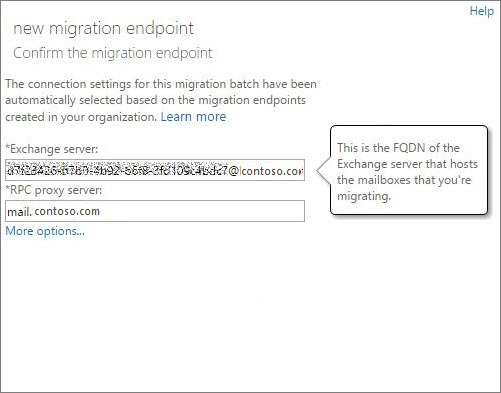 A migration endpoint contains the settings and credentials needed to connect the on-premises server that hosts the mailboxes you're migrating with Office 365. The migration endpoint also defines the number of mailboxes to migrate simultaneously. For a cutover migration, you'll create an Outlook Anywhere migration endpoint. Exchange server: Type the fully qualified domain name (FQDN) for the on-premises Exchange Server. This is the host name for your Mailbox server. For example, EXCH-SRV-01.corp.contoso.com. In a cutover migration, on-premises mailboxes are migrated to Office 365 in a single migration batch. On the Select a migration type page, choose Cutover migration > next. 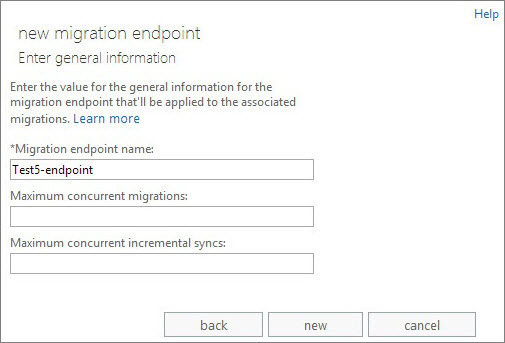 On the Confirm the migration endpoint page, the migration endpoint information is listed. Verify the information and then choose next. On the Move configuration page, type the name (cannot contain spaces or special characters) of the migration batch, and then choose next. The batch name is displayed in the list of migration batches on the Migration page after you create the migration batch. Automatically start the batch: The migration batch is started as soon as you save the new migration batch with a status of Syncing. Manually start the batch later: The migration batch is created but is not started. The status of the batch is set to Created. To start a migration batch, select it on the migration dashboard, and then choose Start. If you created a migration batch and configured it to be started manually, you can start it by using the Exchange admin center. On the migration dashboard, select the batch and then choose Start. You'll be able to follow the sync status on the migration dashboard. If there are errors, you can view a log file that gives you more information about them. After the migration is done, the sync status is Synced. When people outside of your organization send you email, their email systems don't double-check where to send that email every time. Instead, their systems save the location of your email system based on a setting in your DNS server known as a time-to-live (TTL). If you change the location of your email system before the TTL expires, the sender's email system tries to send email to the old location before figuring out that the location changed. This location change can result in a mail delivery delay. One way to avoid this is to lower the TTL that your DNS server gives to servers outside of your organization. This will make the other organizations refresh the location of your email system more often. The place to change the TTL setting is on your email system's MX record. This lives on your public-facing DNS system. If you have more than one MX record, you need to change the value on each record to 3,600 seconds or less. Email systems use a DNS record called an MX record to figure out where to deliver emails. During the email migration process, your MX record was pointing to your source email system. Now that the email migration to Office 365 is complete, it's time to point your MX record at Office 365. This helps make sure that email is delivered to your Office 365 mailboxes. Moving the MX record will also let you turn off your old email system when you're ready. For many DNS providers, there are specific instructions to change your MX record. If your DNS provider isn't included, or if you want to get a sense of the general directions, general MX record instructions are provided as well. It can take up to 72 hours for the email systems of your customers and partners to recognize the changed MX record. Wait at least 72 hours before you proceed to the next task: Delete the cutover migration batch. After you change the MX record and verify that all email is being routed to Office 365 mailboxes, notify the users that their mail is going to Office 365. After this you can delete the cutover migration batch. Verify the following before you delete the migration batch. All users are using Office 365 mailboxes. After the batch is deleted, mail sent to mailboxes on the on-premises Exchange Server isn't copied to the corresponding Office 365 mailboxes. When you delete a cutover migration batch, the migration service cleans up any records related to the migration batch and then deletes the migration batch. The batch is removed from the list of migration batches on the migration dashboard. It can take a few minutes or the batch to be removed. Activate Office 365 user accounts for the migrated accounts by assigning licenses: If you don't assign a license, the mailbox is disabled when the grace period ends (30 days). To assign a license in the Office 365 admin center, see Assign licenses to users in Office 365 for business. If you keep your Exchange Server, you should also make sure that Autodiscover DNS CNAME record has to point to Office 365 in both internal and external DNS after the migration so that the Outlook client will to connect to the correct mailbox. Replace <ServerName> with the name of the Client Access server and run the following command in the Exchange Management Shell to prevent client connections to the server. You'll need to run the command on every Client Access server. Decommission on-premises Exchange Servers: After you've verified that all email is being routed directly to the Office 365 mailboxes, and no longer need to maintain your on-premises email organization or don't plan on implementing a single sign-on solution, you can uninstall Exchange from your servers and remove your on-premises Exchange organization.